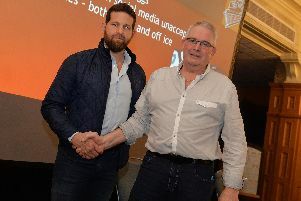 Scores of the city’s hottest ice hockey stars were out in force recently to celebrate the official arrival of Sheffield’s first bar devoted to the sport. Members of the Sheffield Steelers, Sutton Sting and the Sheffield Bears packed into FirePit Rocks on West Street to mark the occasion. The bar – which first opened in July - has spent the past few weeks amassing an enviable amount of ice hockey-related memoriabilia with large amounts of wall space devoted to the region’s long-standing association with the sport. FirePit Rocks have also signed sponsorship arrangements with all three teams and are looking to screen regular ice-hockey matches in the future. FirePit Rocks owner Rick Bailey said: “Ice hockey is a massive spectator sport in Sheffield and provides great family entertainment. We wanted to show our commitment to it and provide fans and players with their very own home from home. FirePit Rocks is now the official sponsor of Evan McGrath – the Canadian star player that recently joined the Sheffield Steelers team from German side EC Kassel Huskies. They have also sponsored rising star Bailey Templar of Sutton Sting – the Sutton-in-Ashfield based team that plays its matches at Ice Sheffield – and they are official sponsor of the Sheffield Bears. the university team that also play their matches at the same venue. FirePit Rocks is thought to be the country’s first ‘dive bar’ outside of London.